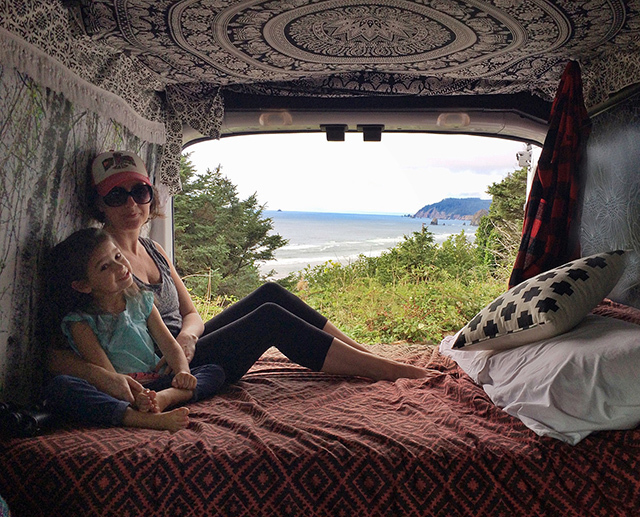 I shared a while back that we bought a Ford Transit van and we have slowly been converting it into a camper van for our family adventures. 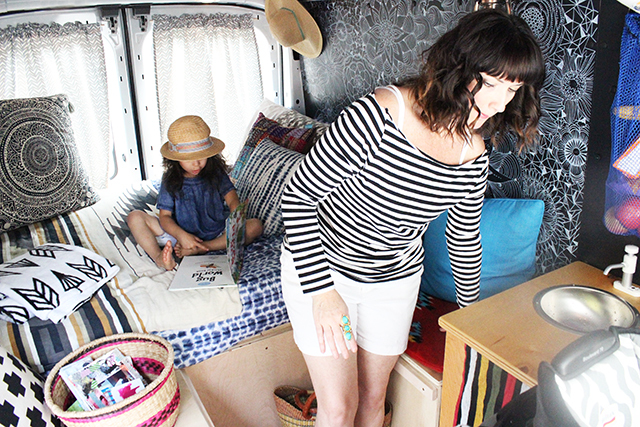 Back in June I shared some of the process and today I thought it would be fun to share another peek into the van project. 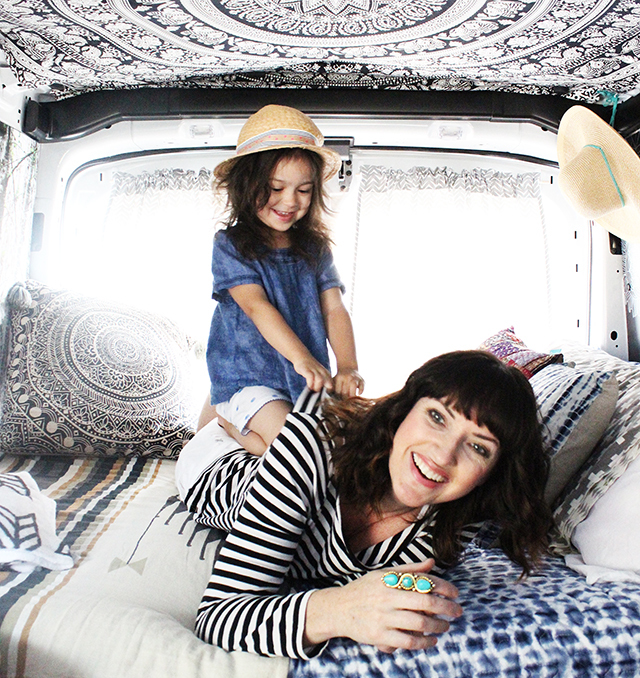 So I have to remind you that at this point in our lives, the van is for fun small(er) trips. 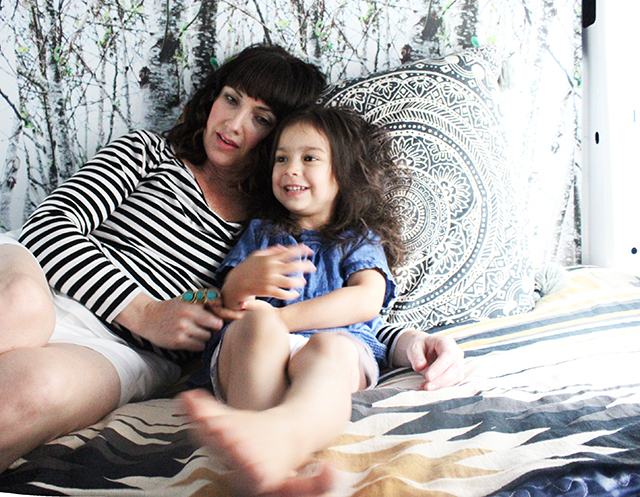 Since we have a toddler, we won't be living out of it for months at a time. This has given us a little more flexibility be simple but creative with the interior. 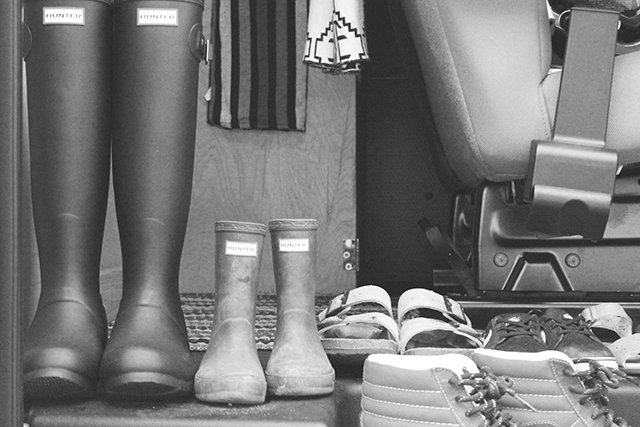 In the van conversion world, many people turn their vans into something that will work as a full time home or will function for months of travel on the road- this is not us! 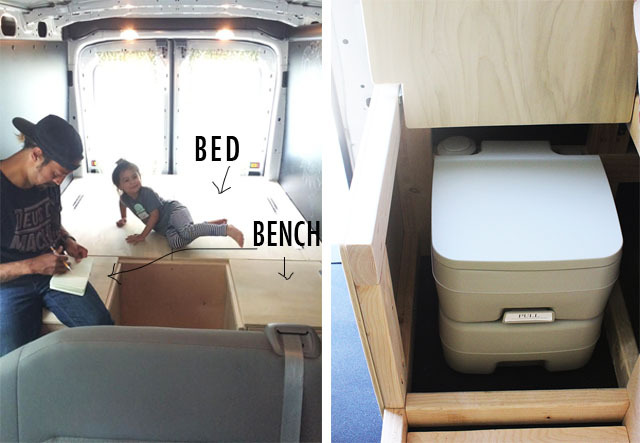 We wanted a few key features for our family- a queen size bed in the back with storage underneath (for camping gear, surfboards, a cooler, etc), a potty chair for long road trips and cabinet with a sink. We also wanted the inside to feel really creative! I drew pattern all over one of the walls. For the adjacent wall I wanted to do something a little different so I designed my own peel and stick wall paper from Spoonflower. 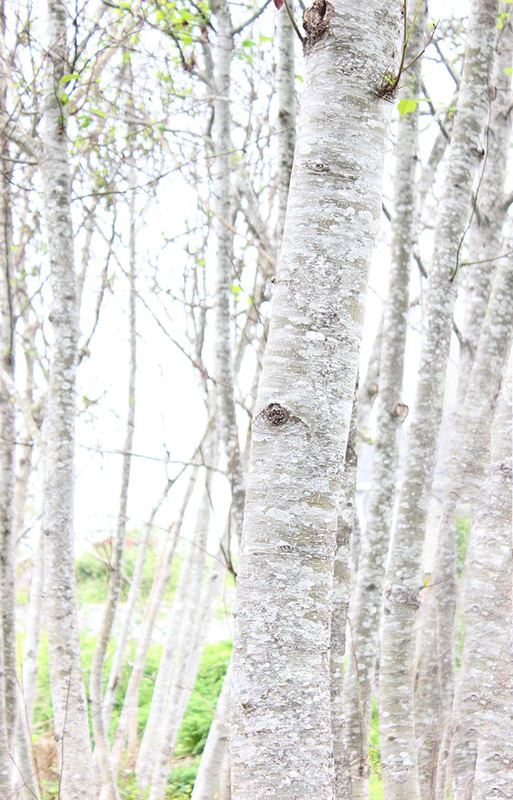 I wanted to bring a little of the outdoors inside so I photographed some of my favorite trees in our backyard, I did a little creative editing in Photoshop and turned that photo into a repeat design. 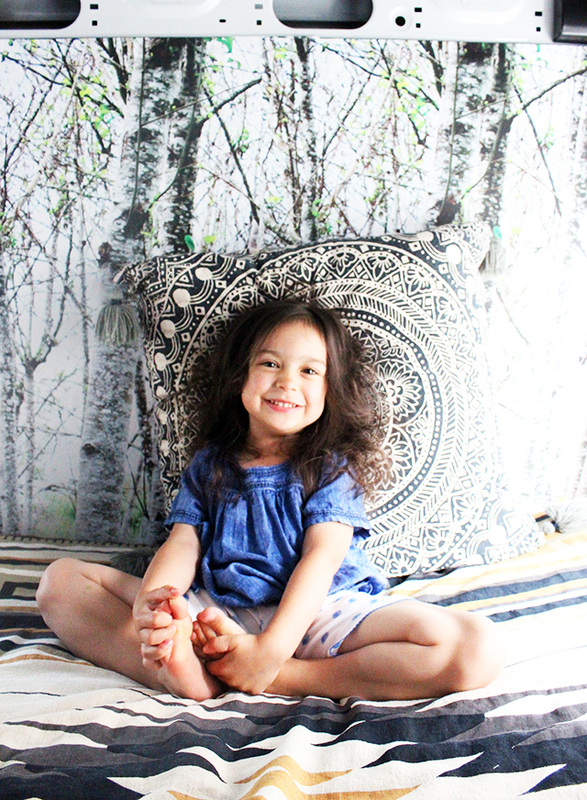 I then uploaded my design to Spoonflower and created a roll of peel and stick wall paper. It was SO easy to install- as simple as peeling off the backing and sticking it to the wall. The peel and stick wall paper is made from 100% polyester which means you can dust and wipe it down! 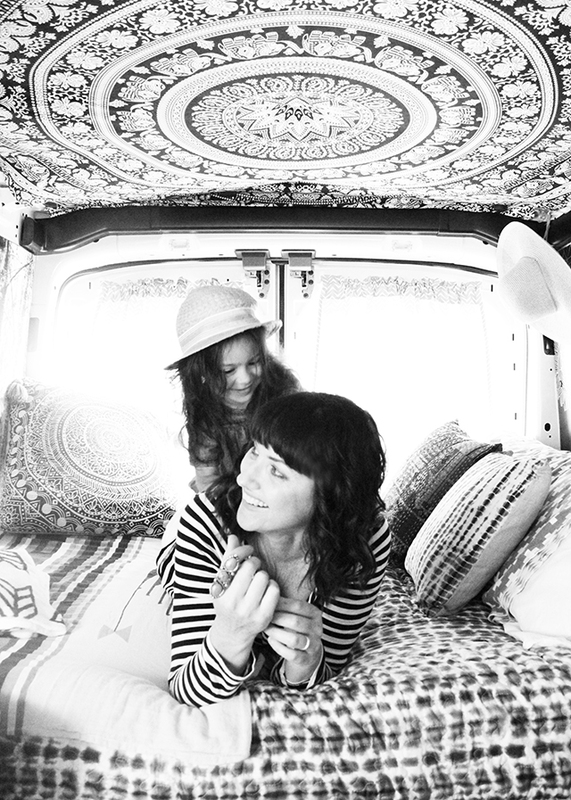 If you recall, we designed the back of the van to have a large platform for a bed that has two bench seats attached. Underneath one of those seats is a camping flush toilet. 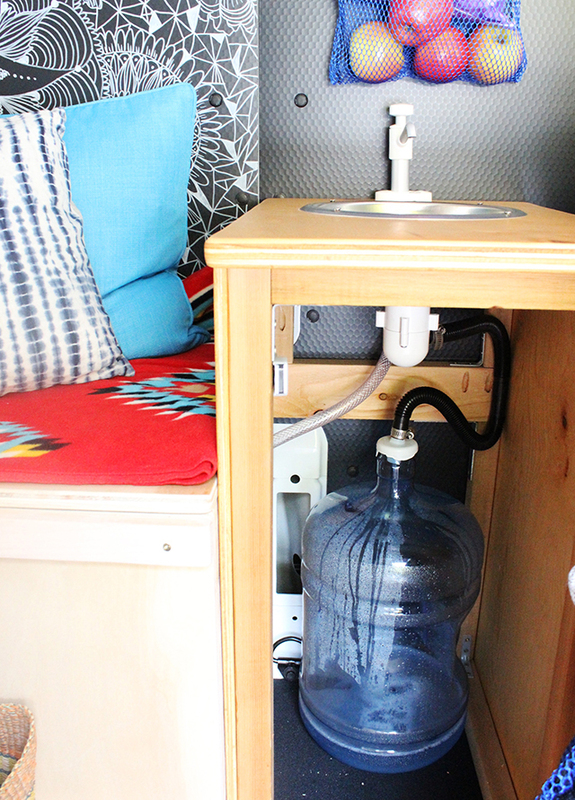 The adjacent bench now holds our clean water/plumbing for the sink that Andy built. A feature that we really wanted was a small cabinet and sink for hand washing and food prep. 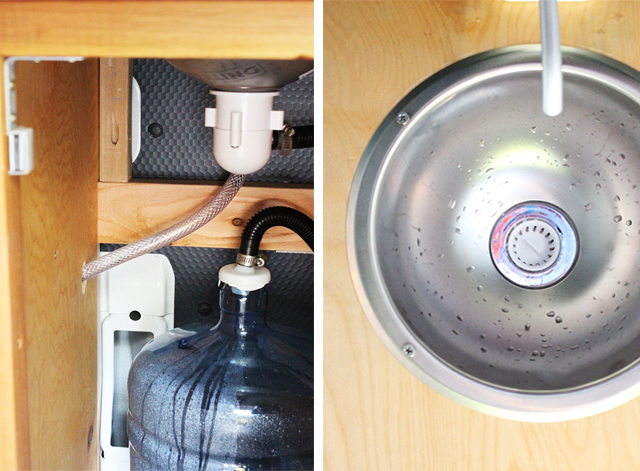 Andy built a small cabinet that has a sink bowl and pump faucet. Below the sink is where we keep the bottle for grey water (or the used water from the sink). The clean water (attached to the faucet) comes from another bottle under the bench. The next project is to add a removable cutting board/cover for the sink so we can have additional work space when we are not using the sink. The sink was a MAJOR game changer for the space. Since we spend a lot of time hiking and outdoors (often in places there are no bathrooms) it has been really nice to have the ability to clean up! 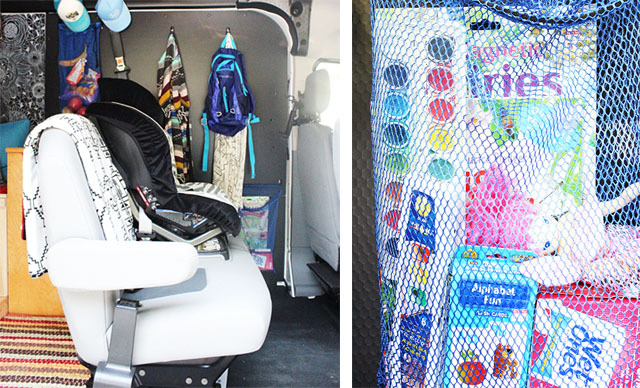 The other addition we made was installing lots of hooks all over the van for hanging extra clothing, backpacks and mesh bags for storage. For me this has made a big difference in keeping the space organized. 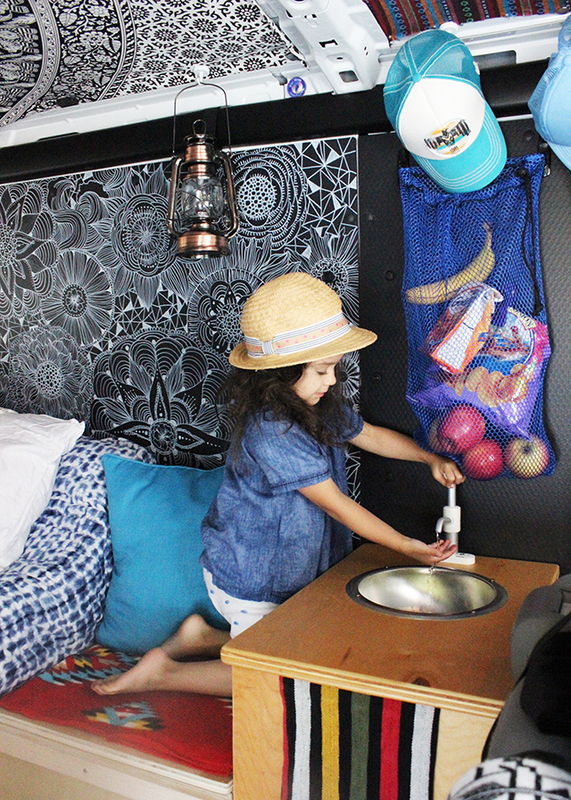 We still have a few more projects to complete but so far we are loving our mobile living space! 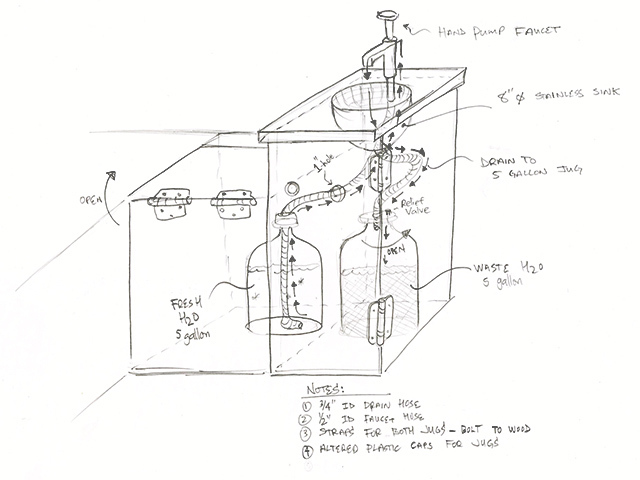 Your pumpstation ist really a great idea - so simple without electric !!! I love seeing this develop! Ok I totally want to move in! Love the space! i love it! and i really enjoy watching the progress of the project. the real life issues that come up. and that sink is genius! i agree that is probably the best decision! 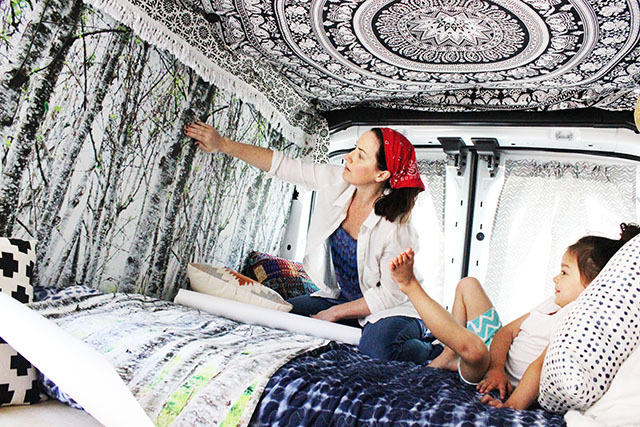 This is probably the most beautiful van re-design I've ever seen! Amazingly creative minds. Lucy is growing like a weed. So pretty. 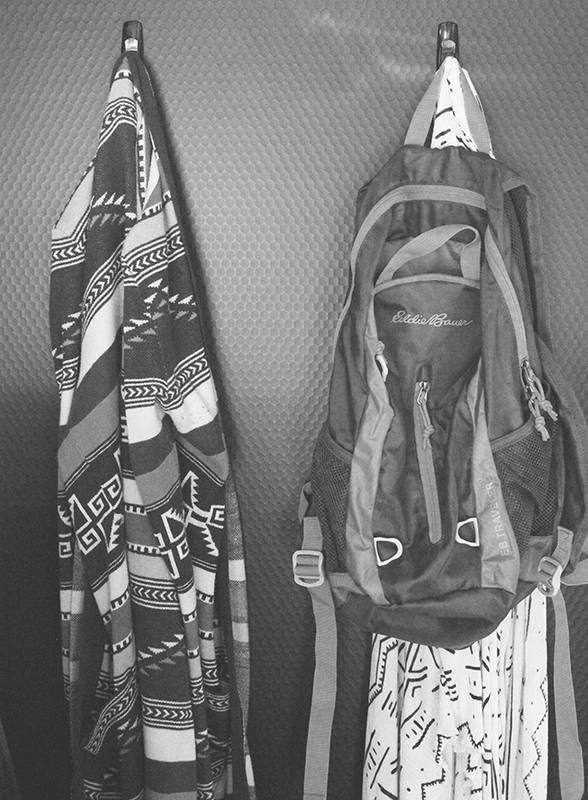 I so want to go with you for a trip!!! LOL I really would love more info on the process of that stick and peel wallpaper. Maybe a tutorial??? LOVE LOVE this so much!! Andy did an awesome job, would never have thought to have a sink/potty. Looks just like home now, nice and neat and organized. YAY!! Oh dear Alisa, I found your blog through your work. Love the vibrant colours and your creativity. Love the way you live your life with your lil one. I have my own lil 3 years old girl and I work in creative industry doing mostly commercial work for clients. Yet, at time I got so bored and look forward to start drawing again, all about things I like. I adore your courage and perseverance in keeping up with your work while caring for you girl. Look forward for more bits and pieces about your work and family. Cheers. 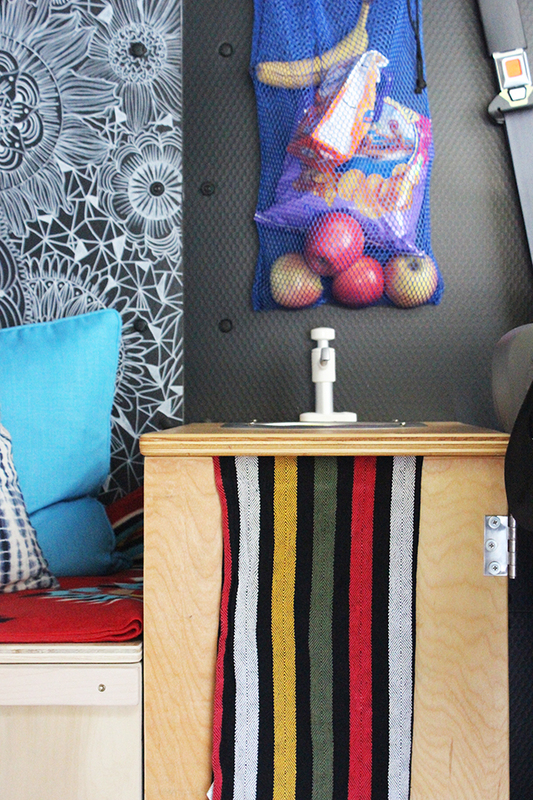 Your camper van is so dreamy. 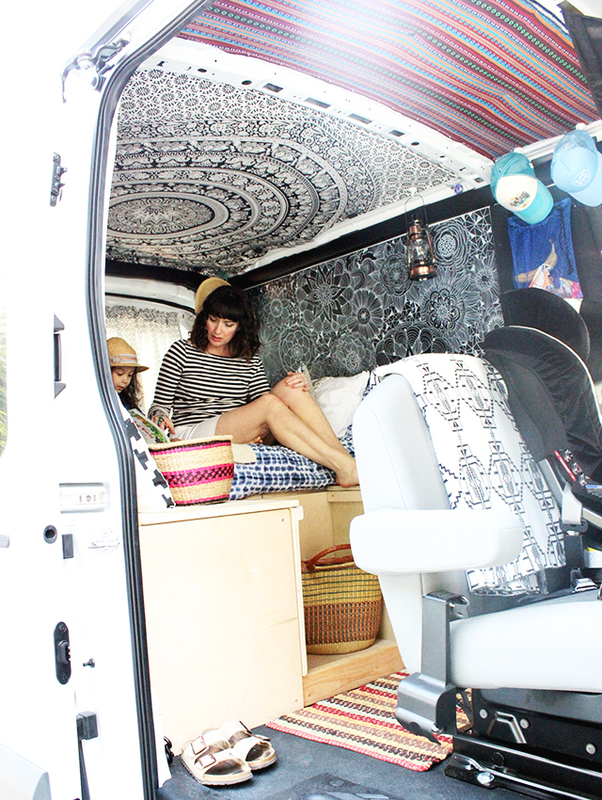 My husband and I have a camper van on our wish list. Maybe we shall see you on the road? Your van looks AWESOME! And I love the sink set up! That's really smart. 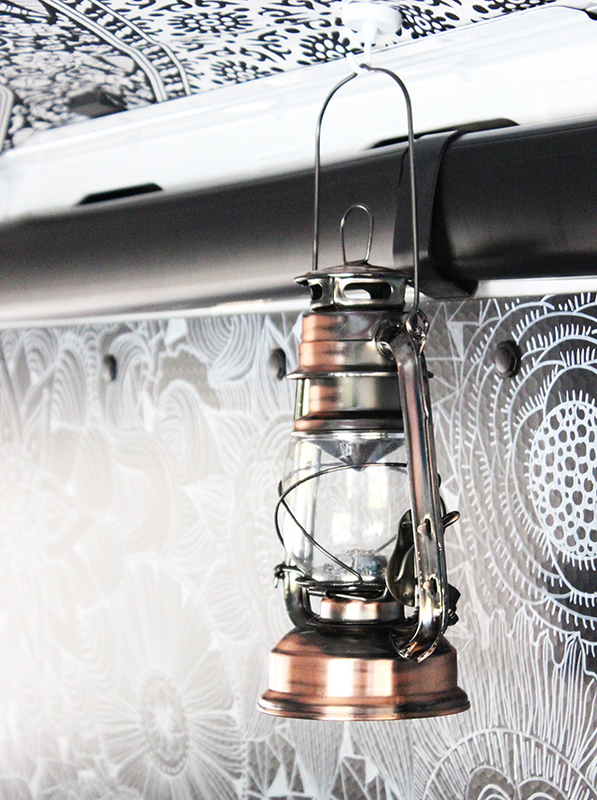 We are in the process of redoing our vintage Field & Stream Tin Can Camper. Will be posting more on it on my blog www.linesbylisa.com. Maybe there is a way I can modify my sink to work like yours when we are dry camping. :o) Thanks for sharing! I love your blog! Your art is so inspiring! a fresh batch of art journals in the shop!